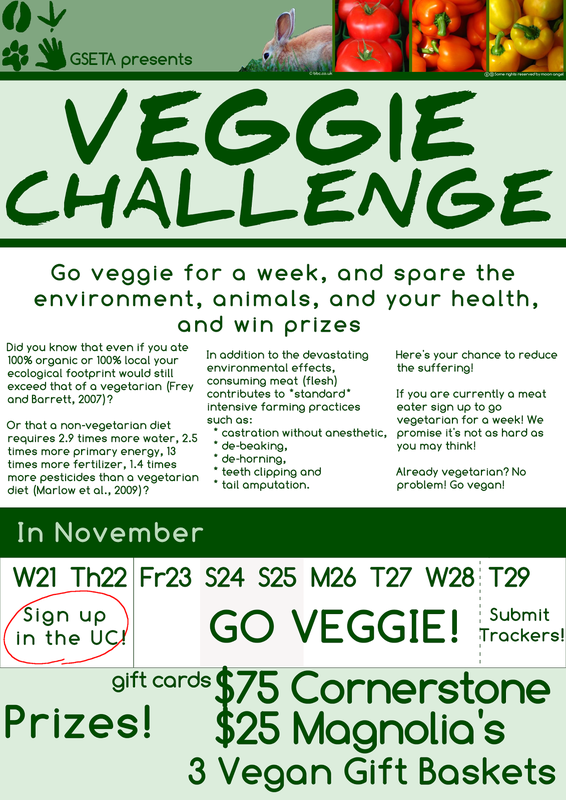 This year GSETA hosted another Veggie Challenge, and this time I coordinated it, as well as volunteered and participated. The poster was basically the same, and we did well in signing up participants: almost 200. About 1 in 5 ballots were returned. Hooray! I've been vegan for over a year now, so for my challenge, I tried to avoid purchasing any food that resulted in plastic waste. I actually tried to buy nothing that resulted in plastic waste, and I failed, multiple times. 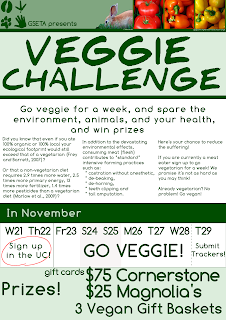 With the Veggie Challenge, we distribute trackers, and participants get to check off each meal that they successfully eat vegetarian (or vegan) for. For the purpose of the draw, we understand if people make mistakes, and each returned ballot is equal (unless someone didn't try at all, in which case ...). Habit and a failure to remain conscious of my actions foiled me 3 times, and helped remind me how difficult it can be for someone trying vegetarianism or veganism to avoid mistakes. Fortunately, the plastic challenge was very educational for me. The first day of my plastic challenge went very well, as it was also Buy Nothing Day (more anon), and I simply purchased nothing at all. There was still danger from obtaining free things generating plastic waste, but that simply did not come up. Problems arose immediately the next day, even when I thought I was being clever. First, I was clever, and decided I would go to the Guelph's Farmers' Market for most of my materials. The plastic challenge is already easy in that I get to still use things I've already acquired (a tough one would involve starting from scratch and avoiding all potential plastic waste). I reckoned I would stock up on plastic-free produce and bread at the Farmers' Market (conveniently next door) with my hip reusable bags and sail through the week. Then I bought salsa from the Salsateria booth. Salsa from the Salsateria booth comes in a plastic container. It's not a really useful plastic container. The lid is a pain, and it melts in the microwave. The salsa is very oily and tends to stain the plastic a little. I realised my mistake moments after purchase, and the vendor let me swap it for a challenge-compliant wrap. Few. Disaster averted, I thought. I also asked whether it was possible to bring my own container to Salsateria and just have them fill it, and apparently that should be doable. Hooray! Then I went to go replenish my cleaning supplies. Again, clever I thought I was! I went to Footprints, the Eco Store, in downtown Guelph, where you can also bring your own containers and refill them in bulk fashion! It's brilliant! I currently have my shampoo, hand soap, and dish soap from there. My general cleaner will come from there once I've exhausted my current supply. I'll be sad if I move somewhere without refillable cleaning supplies. (For the record, they all seem effective at their jobs, despite having eyed them with suspicion; the only qualm is that the shampoo doesn't lather much.) The liquids also claim to be at least more environmentally friendly than standard fare, so hooray! One thing to note is that the barrels they are dispense from are themselves large and plastic, but I understand they are themselves refilled. Even if they weren't, at least that would be much less total waste. But then I bought toothpaste. I didn't realise exactly what I was doing because the plastic portion (the tube) is not immediately visible, hidden within a cardboard box. Besides the fact that the cardboard box is largely waste itself (even if recyclable), the brand I buy is generally considered environmentally friendly, Green Beaver. I am told I can apparently use baking soda effectively, but I'm a bit wary of its abrasiveness, given how soft teeth actually are. A friend desperately needed to go grocery shopping and I tagged along as a grocery mule. And then I noticed many things I also needed. And a couple things I didn't. I ultimately purchased Christie's maple fudge cookies (because they are VEGAN! ), almost picked up some of their Pirate peanut butter cookies (because they are vegan! ), and perhaps it was then that I picked up some Fudge-Os? (or it was a clone, but either way, they were VEGAN; it's not just regular Oreos, people!). The cookies had totally plastic packaging. I generally bake my own cookies, though, so I don't usually run into a problem here. I also picked some hippy brand of cereal, which is delicious, and contained plastic freshness bag. I could go to a bulk store to get in a container of my own, though. Finally, I bought a Clif Builder bar. I use these to supplement my diet as well. I was otherwise avoiding them throughout the week. I should look into an alternative, like a powder mix and have shakes in the morning, or something. I blame my friend Frank for addicting me to Clif Builder bars, though. Near the end, I bought another Clif Builder bar because I felt a bit down and eating chocolate makes me feel better. :D It was strange experiencing how significantly being down could void my week-long intent to avoid plastic. I wonder if that happens with some people who try vegetarianism and veganism; they just become apathetic due to other circumstances and lose any sense of purpose behind their action. It was a great attempt, unless you count all the many failures. I used to actually do a somewhat conscious job of trying to minimise plastic waste up until a year and a bit ago, when I sort of lost sight of the purpose then and grew a tad apathetic, as I did on day X. It makes a lot of simple sense to me: I don't need this plastic for this item, so why get it? It's more resources being used, and more money being spent. Some people might think that helps add a segment to our economy, but I want to carve out inefficiencies generally. I was glad that I was able to catalogue a sketch of my usual encounters with unnecessary plastic and was able to postulate alternatives; like going to bulk food stores and using reusable containers more. It limits my choice in some ways (no more Corn Pops) but given an evaluation of a choice as being sufficiently potentially detrimental to the world, is it a valid option to consider at all? It's like chocolate chips: is it a valid choice for me to purchase ones that aren't Fair Trade just because then I can afford to buy more and make more cookies? Given the purported situation of cocoa farmers, no, it's not really a valid choice. Those I currently purchase in bulk form from the Flour Barrel in Guelph. I don't think their brand is Fair Trade certified, like Camino are, but Camino comes in plastic packaging (and tastes not great). How do I evaluate plastic packaging from Camino versus potentially-poor-working conditions from the bulk chip? I'm glad I could consider further what an acceptable level of consumption might be; it is a thought that applies to my energy consumption, and any activity that destroys what it uses. Some times I think I want to stop an activity all together, but really maybe I just want to identify what's a good amount. I think I have more thoughts, but I've waited a week too long to share these ones already.